When it comes to world-building in comics, few do it better than Robert Kirkman (The Walking Dead, Invincible, Outcast). His newest series, Oblivion Song, with artist Lorenzo De Felici, is every bit as immersive and complex as his zombies or superheroes. Ten years ago in Philadelphia, hundreds of thousands of people disappeared into the Oblivion, an alternative universe, a dystopian wasteland full of bizarre monsters. After years of trying to retrieve survivors, the government has given up but not Nathan Cole. Despite his funding being suspended, he's determined to find more people and bring them back especially one person in particular. In Cole, Kirkman has his leading man, obsessed, self-serving, addicted, using his transparent altruism to seek out his brother in Oblivion. Fresh from rescuing two people, Cole is even more motivated to continue his daily jaunts into the dangerous landscape funding be damned. This extended issue gives Kirkman the room to explore this world he's created from various angles. From a fanatical perspective of a justified rapture to the minutia of government red tape are covered to fully explain the consequences of such a phenomenon. Even the supporting characters have a stake in what happens with Oblivion like Duncan's PTSD as a survivor to the burden placed on the spouses. Kirkman has thought of everything. He fleshes out a fully formed story that alternates between the complicated and stale real world with the pulse-pounding adrenaline rush of Oblivion. The wild and exciting opening sequence sets the tone of the series from the outset. When you have a premise as inventive and fantastical as an alternative universe of unique monsters it takes artists capable of such grand designs to sell the story. Luckily for Kirkman, Lorenzo De Felici and Annalisa Leoni bring to life these larger than life beasts that are both colorful and imposing. The cartoonish style adds an energy and visceral aesthetic the script demands. De Felici creates a well-designed real world with varied perspective and plenty of detail but lets loose once in Oblivion. Oblivion may be a dangerous wasteland but Leoni's bright color scheme makes it curiously alluring and exciting. 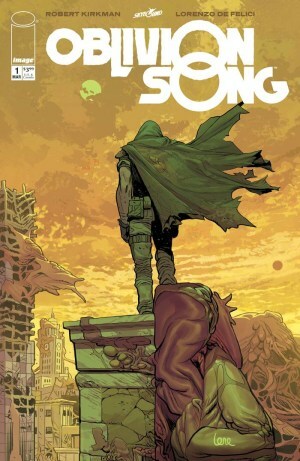 'Oblivion Song' could be the next great sci-fi fantasy in comics. Kirkman has already written a year's worth of material so it'll have every opportunity to catch fire with readers. With that many scripts in the can, Kirkman's passion for the series will likely translate to big sales. More importantly, the book speaks for itself, likely to seduce readers as Oblivion has seduced Cole, monsters and all.